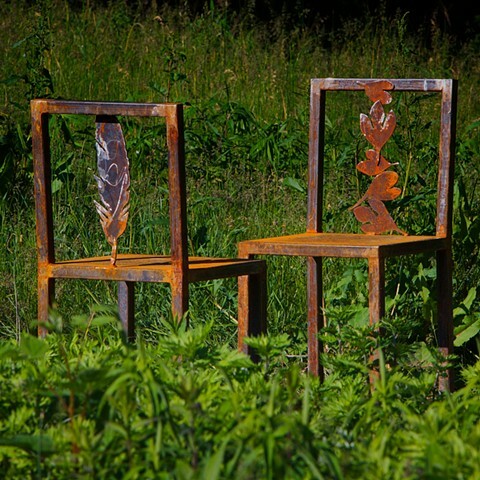 Maryland artist Mary Frank has created two welded steel chairs are set in an open field at the Slocum River land trust, part of the territory that these historic figures roamed. The alignment of the chairs parallels an axis between Mt. Hope, Rhode Island (Massasoit’s home) and Edward Winslow’s home in Plymouth, MA. The chairs face each other at a distance that promotes open communication, and allows the public to imagine themselves in the position of these two men, who were pivotal in determining the course of our nation’s history. Each chair contains a visual symbol that refers to the men’s unique heritage. The Feather refers to Massasoit, also known as “Yellow Feather” while the sassafras leaves of the other chair refer to Edward Winslow, who used sassafras to restore Massasiot’s health. Most of history is written to be centered on the conflicts that determined the course of nations. Mary Frank gives the viewer an opportunity to sit in the negotiating positions of two powerful men who engaged to establish peace in negotiations that could have just as easily gone the other way.